Enchanted Unicorn is an online video slot machine game released in April 2007 and is offered exclusively at online casinos powered by IGT (International Game Technology). This online video slot machine game has 5 reels and 20 pay lines. The theme of Enchanted Unicorn is inspired by a magical, fairy-tale land where enchanted unicorns exist. Experience the magic and riches of the fairy-tale kingdom of the Enchanted Unicorn! When you enter the world of the Enchanted Unicorn slots game, you will notice that the reels have a Celtic feel to them, complete with symbols like damsels, princes, roses, lions, the full moon, and of course, the Enchanted Unicorn. The Expanding Unicorn wild symbol can make the entire reel wild, and the Treasure Chest Bonus Feature game may reward you with riches beyond your imagination! Enchanted Unicorn is actually another Las Vegas favorite, which prompted IGT to release it online to cater to online slots players as well. It is common for slots players to try out the free play mode first whenever they happen to come across a slot game they have never played before. The reason for this is that they would like to evaluate whether or not that a particular slot game is worthy enough to spend real money on. Thankfully, you can play online slot games powered by IGT absolutely for free, without the hassle of downloading anything! The Enchanted Unicorn online video slot game is totally a fun game to play at, especially if you liked fairytale-themed slots with an enchanted unicorn in it. Enchanted Unicorn features expanding wild symbols, wild multiplier symbols, scatter symbols, a Gamble feature, a Treasure Chest Bonus Feature game, and last but not least, it has a 97.39% theoretical average return to player (RTP)! IGT (International Game Technology) has a consistent reputation as being one of the leading slots manufacturers in the whole world, both for land-based and online slot players. Since IGT is considered as the biggest land-based slots manufacturer in the world, it is not surprising that they are excellent in creating and designing great graphics and using sound effects that perfectly complements each and every specific theme of their slots games. 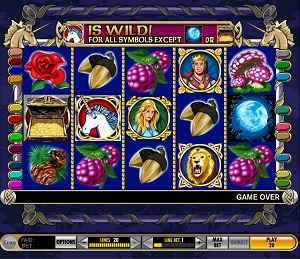 In Enchanted Unicorn online video slot game, the symbols used in the game are cartoon-like, somewhat resembling characters in children’s fairytale cartoons on TV. The background of the reels is a solid blue, which makes a clean backdrop for the symbols. The outer surrounding of the reels is very simple, with entwined rods and unicorn heads. The overall graphic design of Enchanted Unicorn shows many different colors such as blue, red, orange, yellow, purple, gray, green, brown and gold. When you spin the reels, dreamy, children’s fairytale background music will be played. Different celebratory background music (that is perhaps inspired by galloping horses?) will fill your ears whenever you manage to hit winning combinations in this slot game. In Enchanted Unicorn online video slot game, there are no card deck symbols available. The symbols used in this slot game are the Lion, the Prince, the Damsel, Rose, Mushroom, Mulberry, Pine Cone and the Acorn. The Wild Symbol is the Enchanted Unicorn itself. The Enchanted Unicorn wild symbol is also a wild multiplier symbol, which means that it not only acts as a substitute for all other symbols (except for the scatter symbols) in order to help you form winning combinations, but it also multiplies your payout! The Enchanted Unicorn wild symbol only comes out on the 2nd, 3rd, and 4th reels. The Enchanted Unicorn wild symbol multiplies the payout of any winning combination by 2x, provided that it acts as a substitute symbol. Actually, a pay can be multiplied up to 8x if you get 3 Enchanted Unicorn wild symbols to come out in a winning combination. Please take note that 5 Lion winning combinations award are never multiplied, even if there are Enchanted Unicorn wild symbols involved in the pay. There are 2 Scatter Symbols in the Enchanted Unicorn slot game – the Treasure Chest and the Moon scatter symbols. • The Moon scatter symbol is not required to come out on an active pay line for you to win. The Moon scatter symbol can be found anywhere on the reels to complete winning combinations, as long as there are 3 or more Moon scatter symbols that come out. Your winnings are calculated via multiplying the Moon scatter symbol combination payout (refer to the Paytable) by the total number of coins you’ve bet. • The Treasure Chest scatter symbol only comes out on the 1st and 5th reels. When the Treasure Chest scatter symbol comes out in any position on both the 1st and 5th reels at the same time, the Unicorn Treasure Chest Bonus Feature game is activated. The Treasure Chest scatter symbols will not give out any winnings; however, they are your ticket to enter the Treasure Chest Bonus Feature game. Please take note that if you manage to obtain a scatter win and a regular win, you will be paid out accordingly for both of these wins, because the Moon scatter symbol is not required to come out on an active pay line for you to win. Scatter wins are included to the pay line wins. After you obtain any award that is less than 3,000 credits, you are given the choice to gamble your winnings in a completely fair Gamble Feature game of double or nothing. After a win, click the Gamble button to gamble your award. A deck of gamble cards will appear, which contains an equal number of black and red aces. Click Black or Red to guess which color of ace will come out next. If you chose correctly, then your gambled money is doubled! If not, then your Gamble bet is forfeited and the Gamble Feature game will end. You can also click the Take Half button if you would like to put half of your winnings into your main balance, and the other half you would use for gambling. You can click on the Take Half button once prior to each Gamble try. End the Gamble Feature game by clicking on the Take Win button and collect all of your wins. In case you win 5 gambles in succession within the same Gamble Feature game, or if your Gamble award gets to 3000 or higher, the Gamble Feature game will automatically end. Please take note that with the deck of cards, you have a 50-50 chance of unveiling either a black or red ace with every pick. Even if the history of the last 14 outcomes (black, red) is also shown, each card selected is entirely independent. Unicorn Treasure Chest Bonus Feature Game – When the Treasure Chest scatter symbol comes out in any position on both the 1st and 5th reels at the same time, you will activate the Unicorn Treasure Chest Bonus Feature game. While in the Unicorn Treasure Chest Bonus Feature game, you will navigate through a grid filled with treasures, one row at a time. Try to find the Mystical Unicorn so that you can get all the treasures for that row! Do your best to avoid the Evil Wizard because if you meet him, the Unicorn Treasure Chest Bonus Feature game will end immediately. Make it all the way to the end, and the legendary Treasure Chest will open, rewarding you with riches fit for a king! The values on the Unicorn Treasure Chest Bonus Feature game screen have been multiplied by the overall initiating bet. The winnings from the bonus are paid in addition to the line and scatter wins. When the Unicorn Treasure Chest Bonus Feature game is over, you will be taken back to the main Enchanted Unicorn online video slot game, and your Free Spin winnings are included to your overall balance. Enchanted Unicorn has 5 reels where you may bet on as many as 20 pay lines. The minimum bet is 1p up to £5 per pay line. You can wager from 1 up to 5 coins per pay line bet.